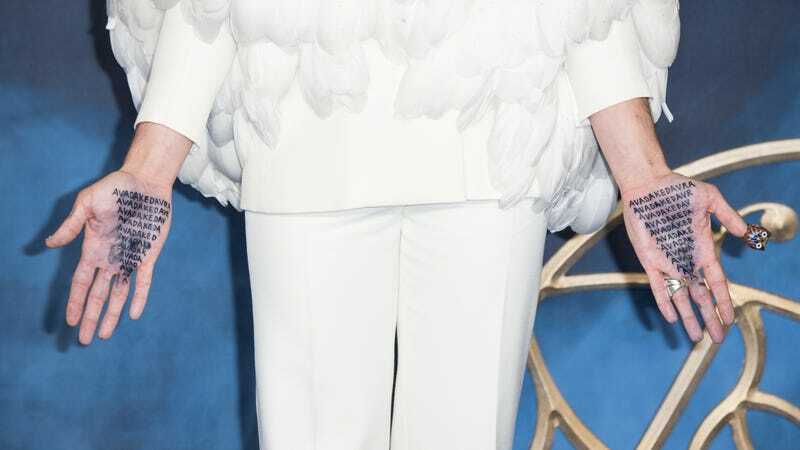 Note:Do not read Ezra Miller’s hands out loud, or you might accidentally contribute to America’s rising epidemic of in-home hexings. Apparently bound and determined to be the one interesting thing about an otherwise bland-seeming Harry Potter spin-off movie, Fantastic Beasts: The Crimes Of Grindelwald star Ezra Miller deployed another amazing red carpet look at one of the film’s premieres today. But we have to point out that there’s one key difference between Miller’s most recent, what-if-Tilda-Swinton-was-a-swan-but-also-kind-of-punk-rock ensemble, and the one he deployed in Paris last week. (And we’re not just talking about the fact that he no longer looks like a blow-up Dalek.) It’s what he has printed on his hands: Avada Kedavra, a.k.a. The Killing Curse. A brief primer for non-nerds: Avada Kedavra is one of the nastiest spells in the Harry Potter universe, the one you cast on someone when you want them to just plain drop dead. (If you’ve seen the movies, it’s the scary green one that Ralph Fiennes is always throwing around in the back half of the series.) In other words, Miller’s new palm ink is the Wizarding World equivalent of walking around with pictures of a couple of loaded guns tattooed on your hands—if saying the phrase “a loaded gun” caused a bunch of bullets to jump out of your mouth and murder whoever you were looking at. Pretty irresponsible bit of costuming, is all we’re saying. C’mon, Ezra; we thought you were better than that.